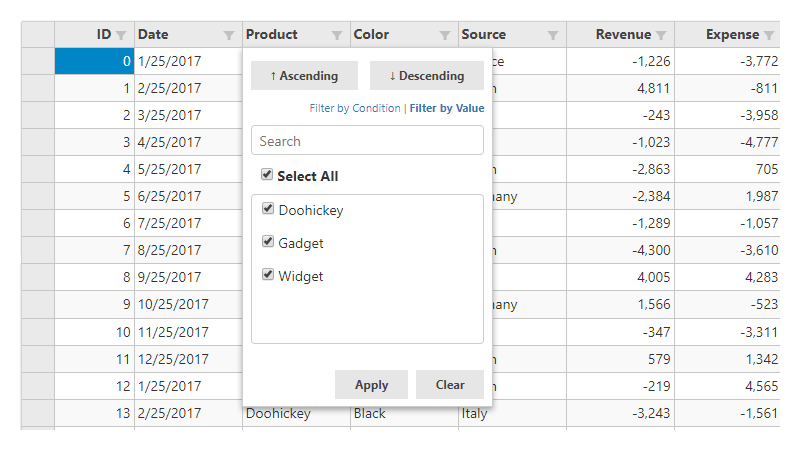 Enable filtering to filter on any column's data, by condition or value. 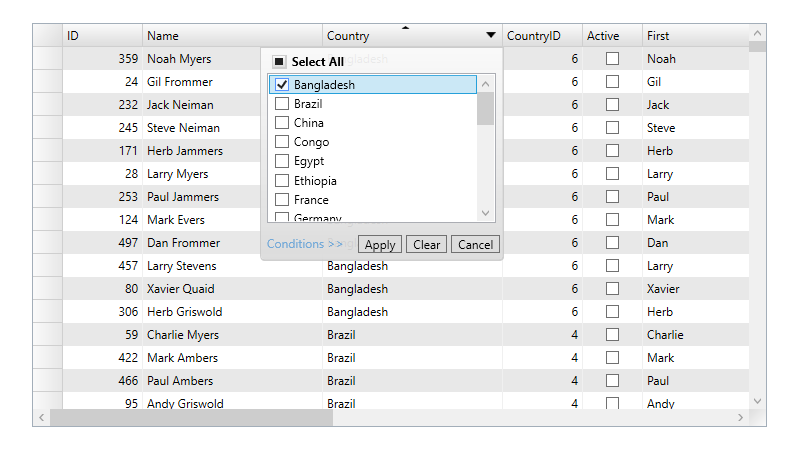 Handle Arabic, Hebrew, and other right-to-left languages with the globalized FlexGrid. 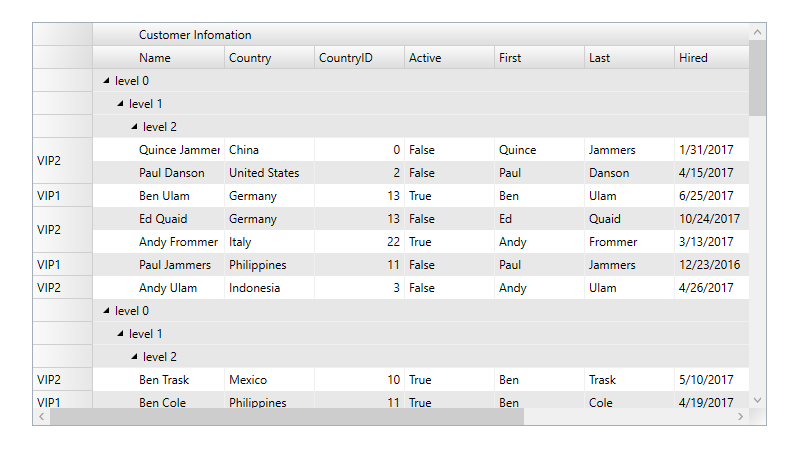 Also supported in ASP.NET MVC and Xamarin. 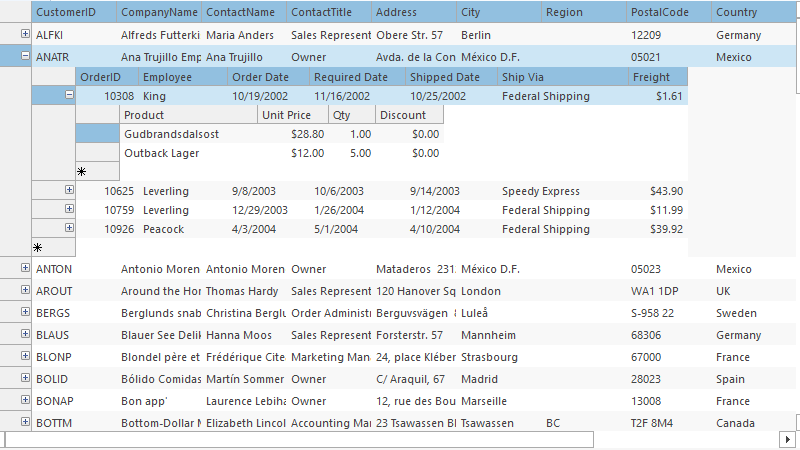 Group data in an Excel-like interface; most work is handled by the CollectionView class. 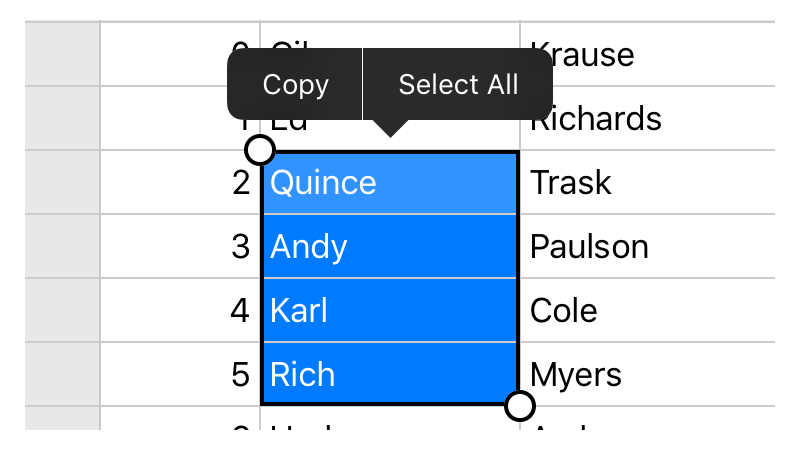 You can also customize the text displayed in header rows. Group panels also available. 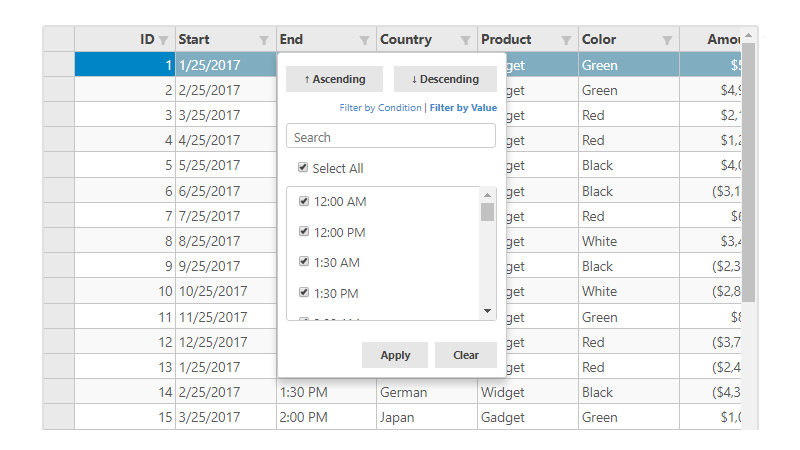 Click the column head to sort on the fly. 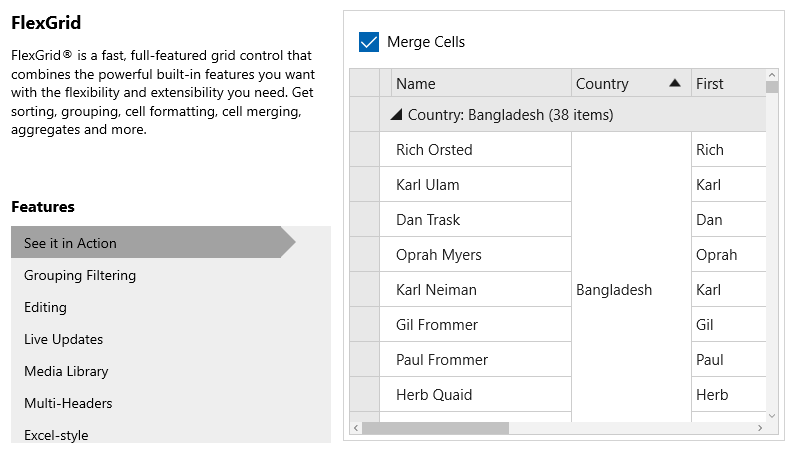 In-cell, fast editing requires no extra Edit columns to switch between modes. 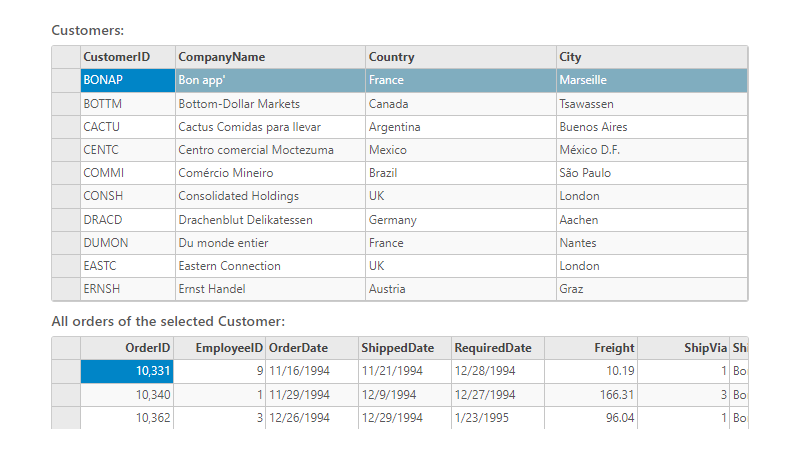 Embed other controls to include drop-downs and datepickers in your grid. 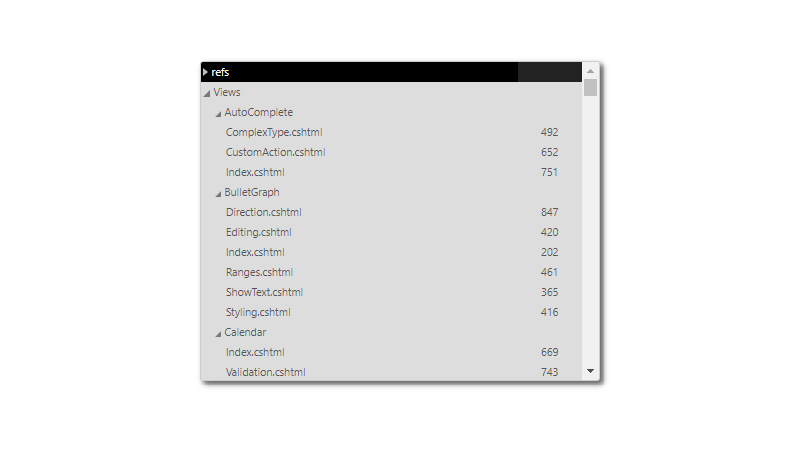 Batch editing also included in some platforms. 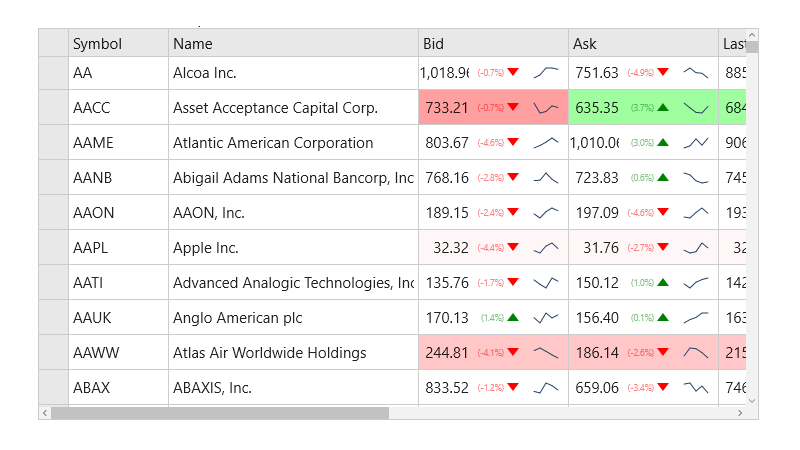 Show stock prices and other rapidly updating information in your grid. 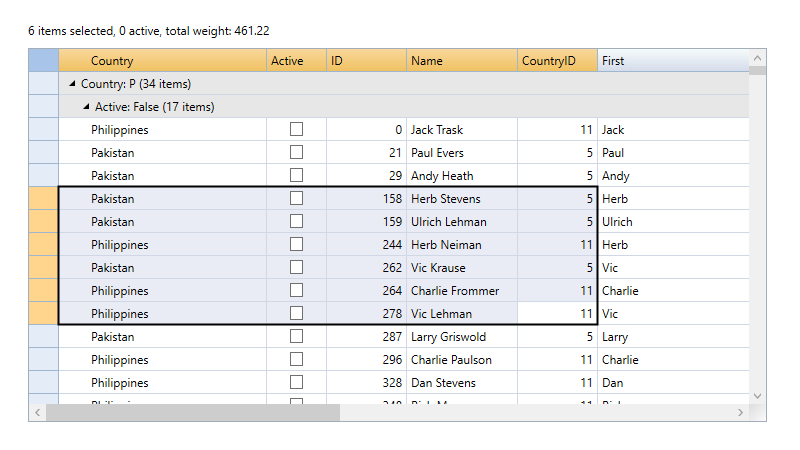 Learn More: WinForms | Supported in WPF, UWP, and Xamarin. 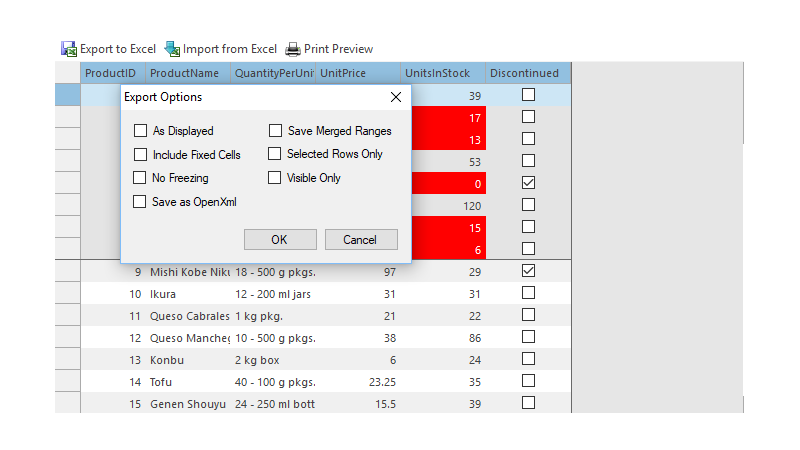 Customize how each cell is rendered by modifying some elements or overriding the painting completely. 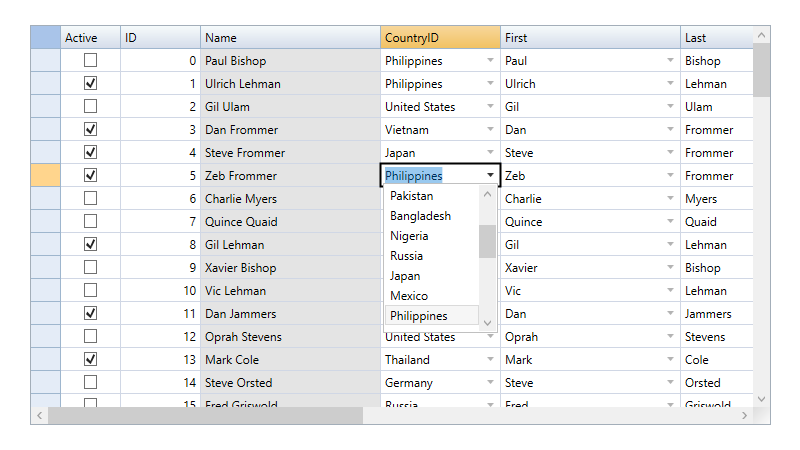 Available in WinForms. 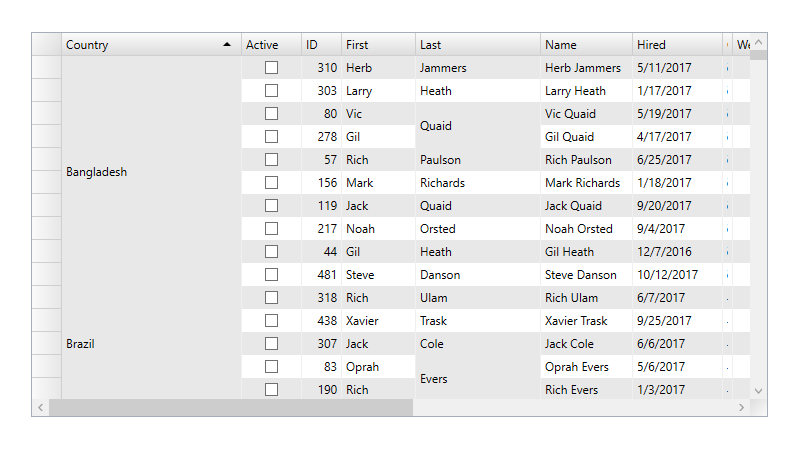 Excel-like cell selection across rows and columns. 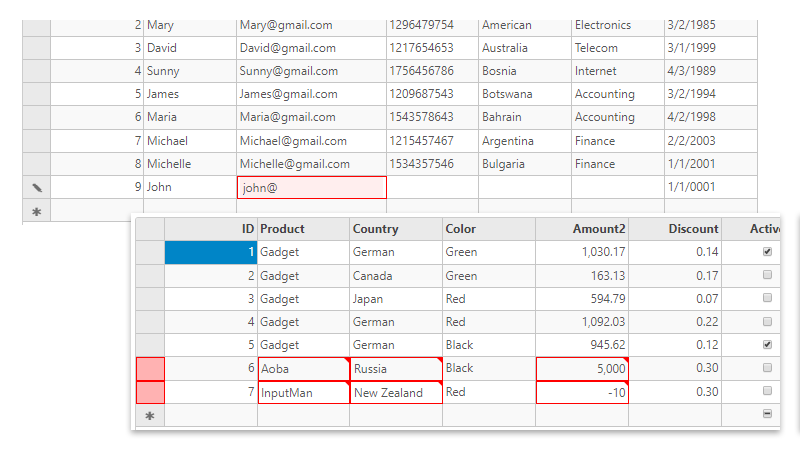 Validate data with the built-in formatting, or use unobtrusive validation to validate as the user types. 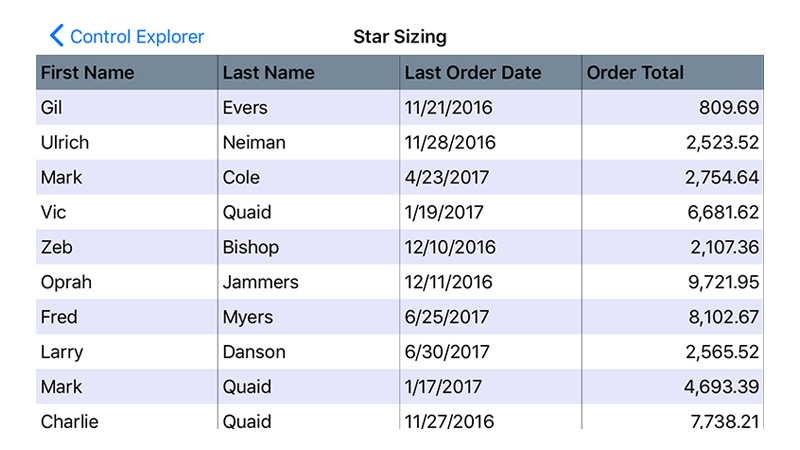 Add a new row to the database with a tap or click. 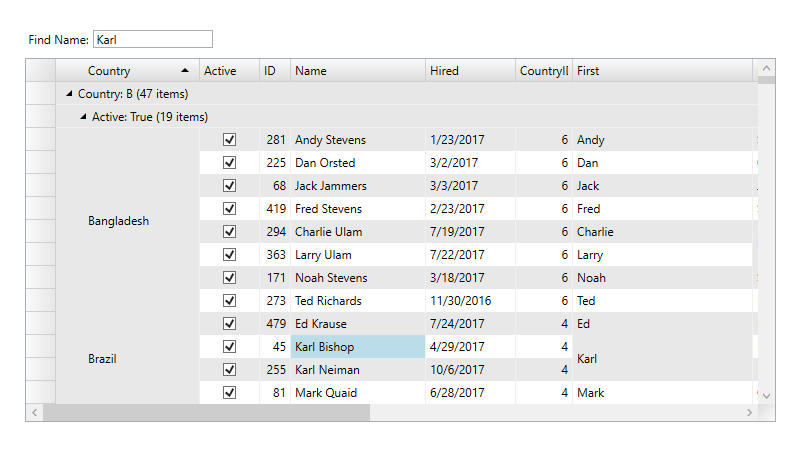 Merge cells across rows and columns dynamically or as needed. Drill down to details on a mobile device. Available in Xamarin. 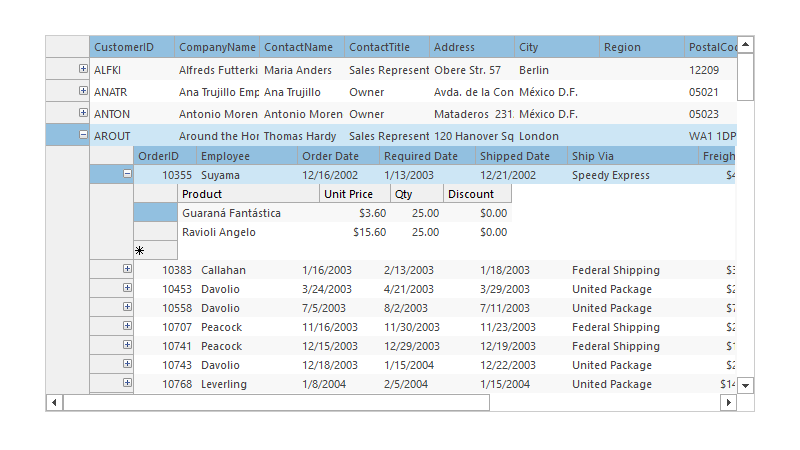 Refresh data in the grid by intuitively pulling down on the grid. Available in Xamarin. 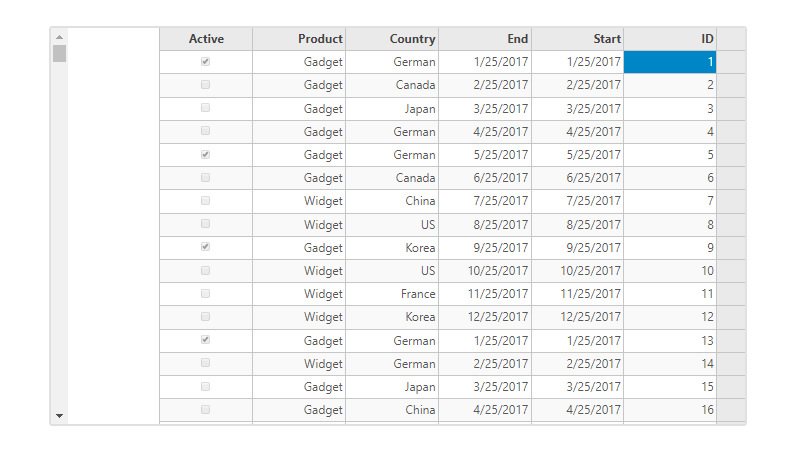 Intuitive cell selection in mobile devices. 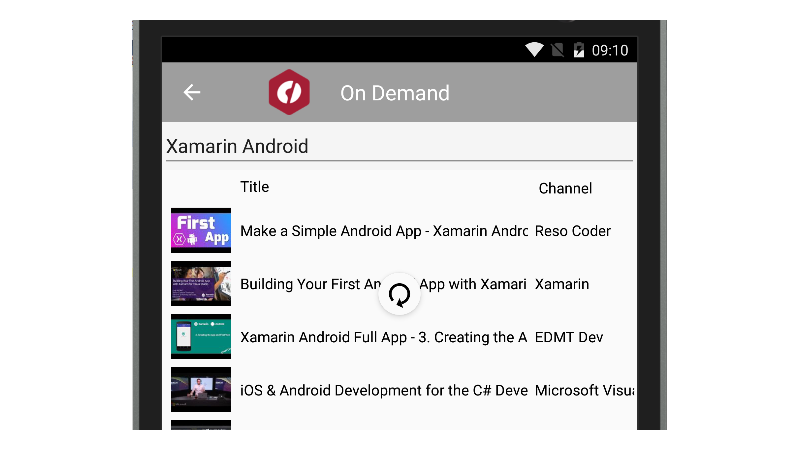 Available in Xamarin. 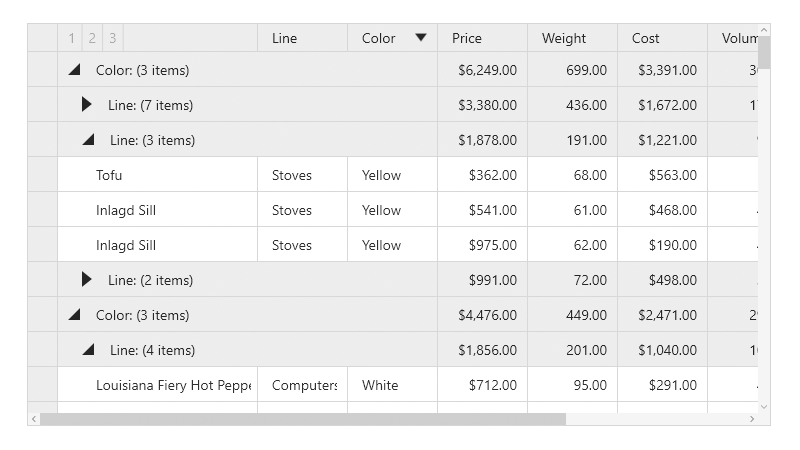 Stretch columns to fill the available space. 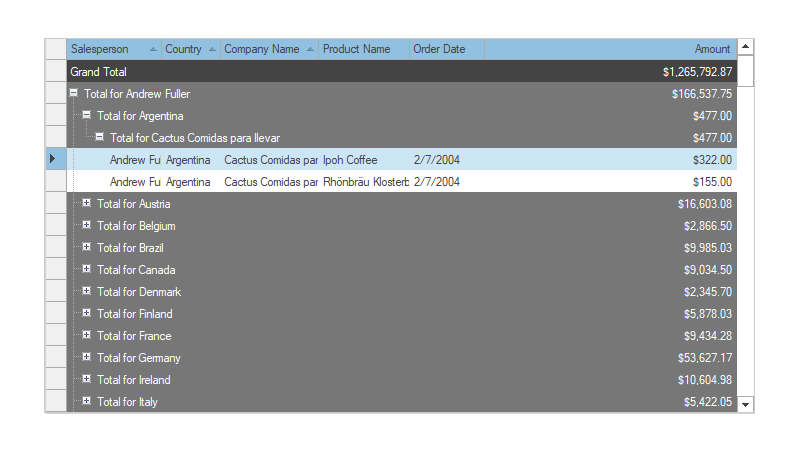 Available in WinForms, ASP.NET MVC, and Xamarin. 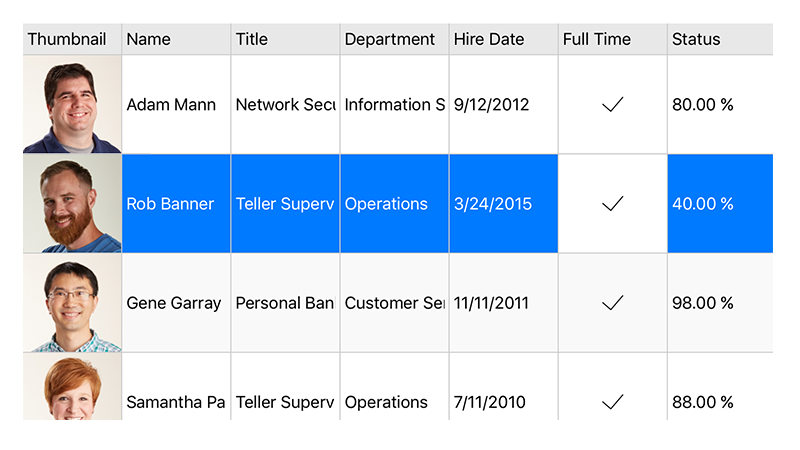 FlexGrid supports both unbound and bound data. 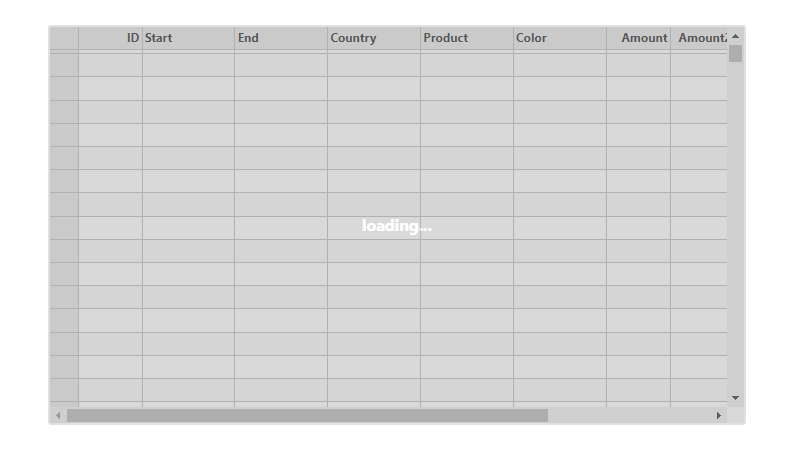 Not available in WinForms, WPF, UWP, and Xamarin. 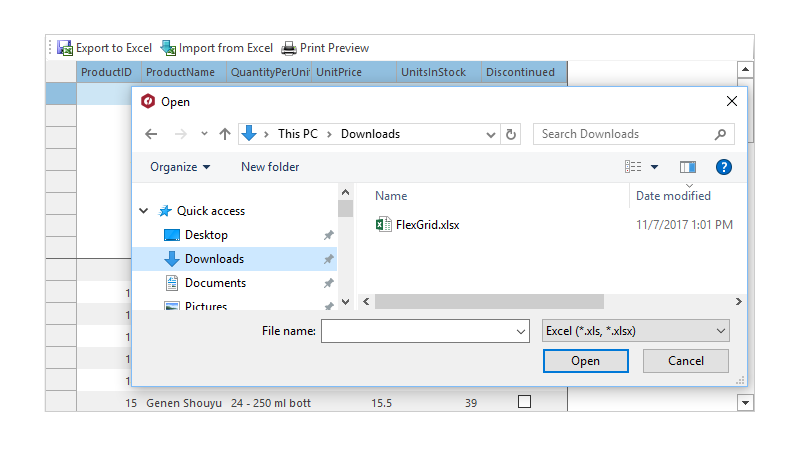 Export selected FlexGrid data to an Excel file. 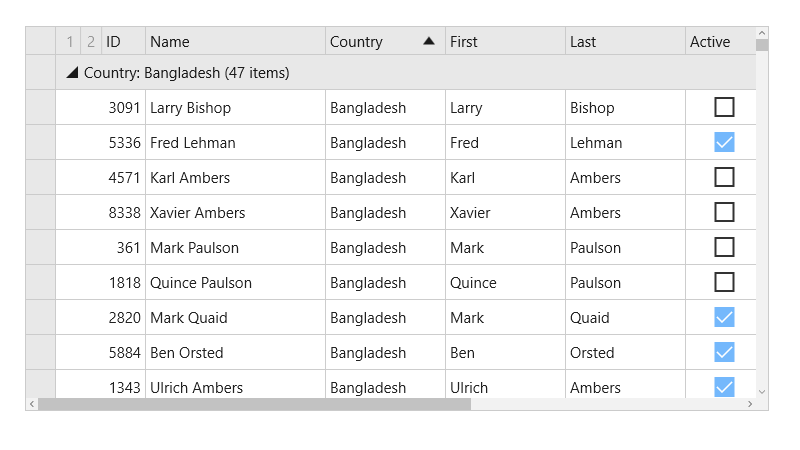 Also supported in WinForms and UWP. Not available in Xamarin. 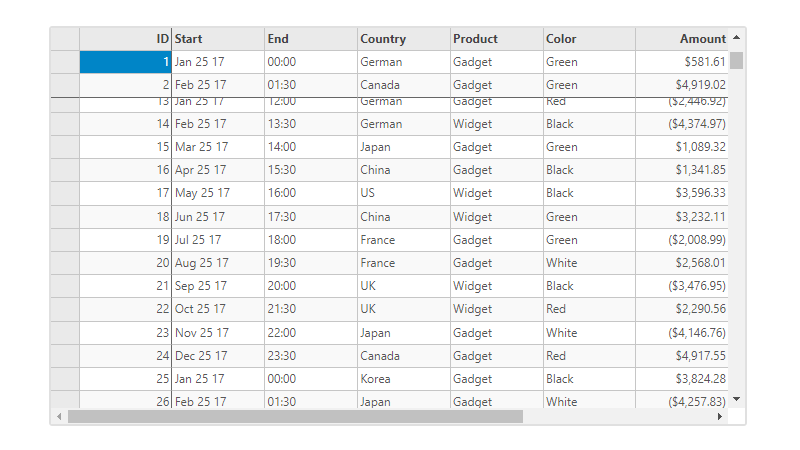 Also supported in WPF and in UWP using C1Excel. Not available in Xamarin. 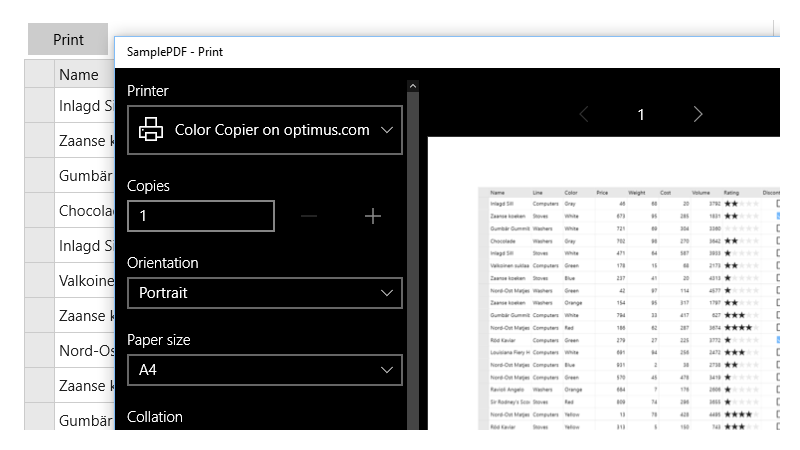 Also supported in UWP using C1PDF. Not available in Xamarin. 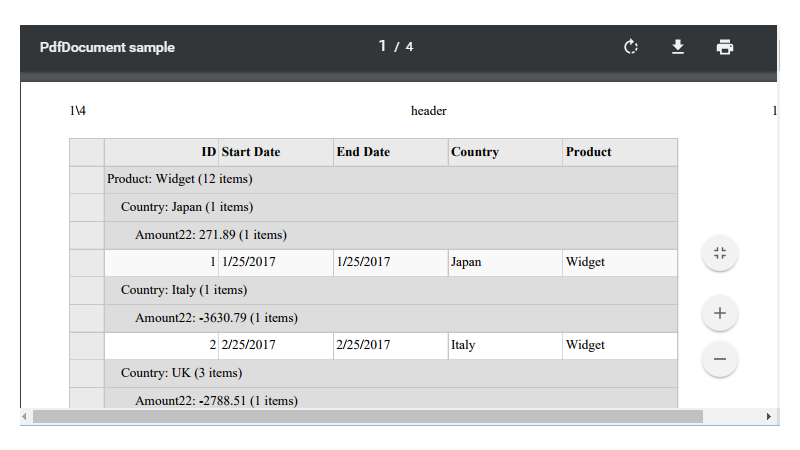 Print your FlexGrid with full support, including page selection and more. 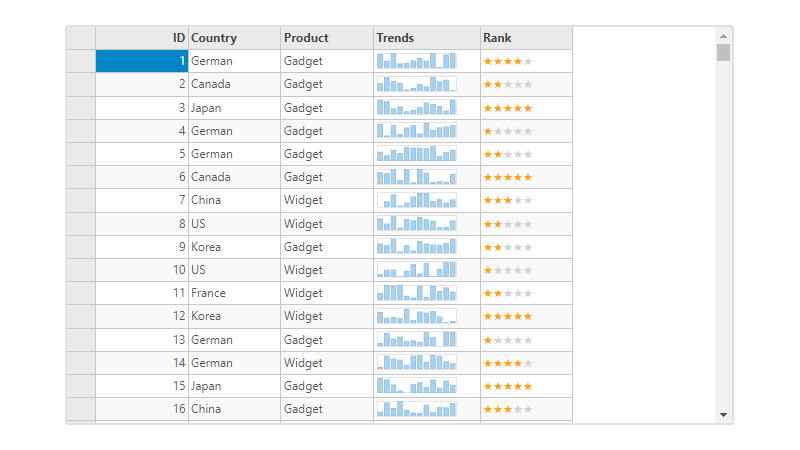 This comprehensive demo desktop app includes all WinForms and WPF demos, including WinForms and WPF FlexGrid demos. 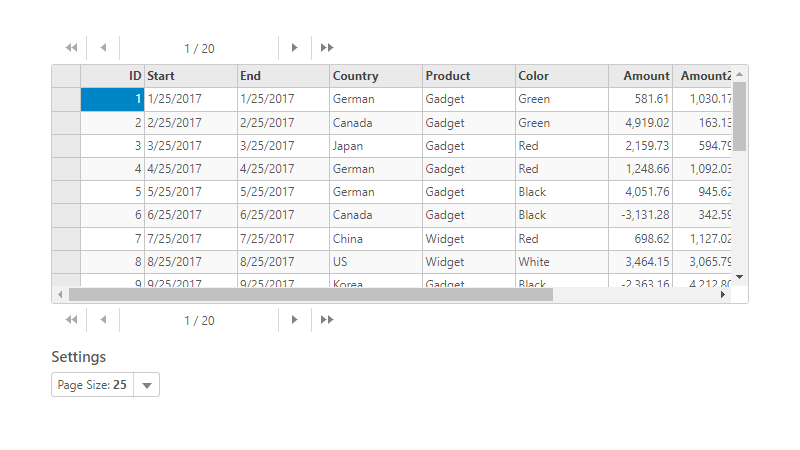 This comprehensive Windows 10 app includes all UWP UI controls, including full FlexGrid features. 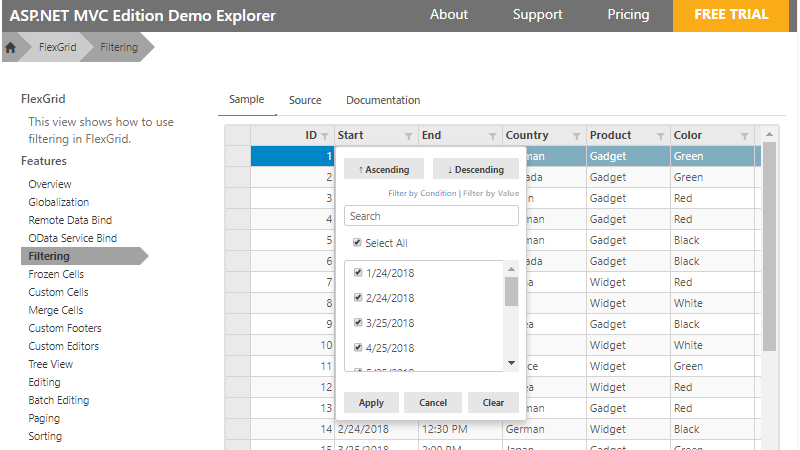 View this control explorer with all ASP.NET MVC controls, including MVC data grid and interactions. 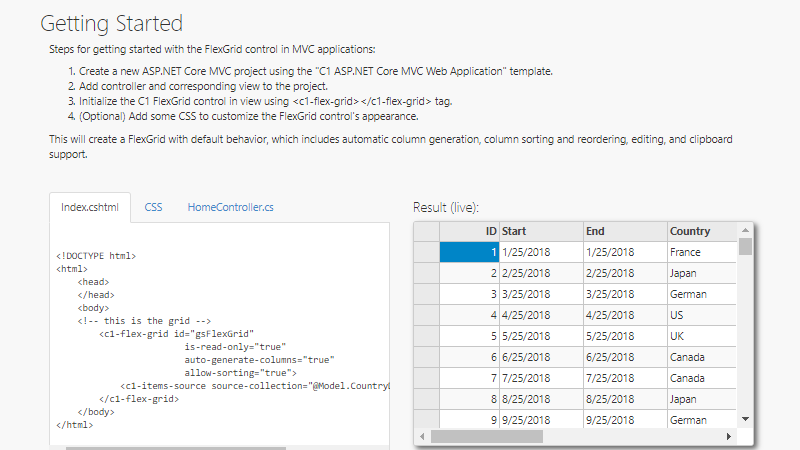 These tutorials get you started with MVC FlexGrid. 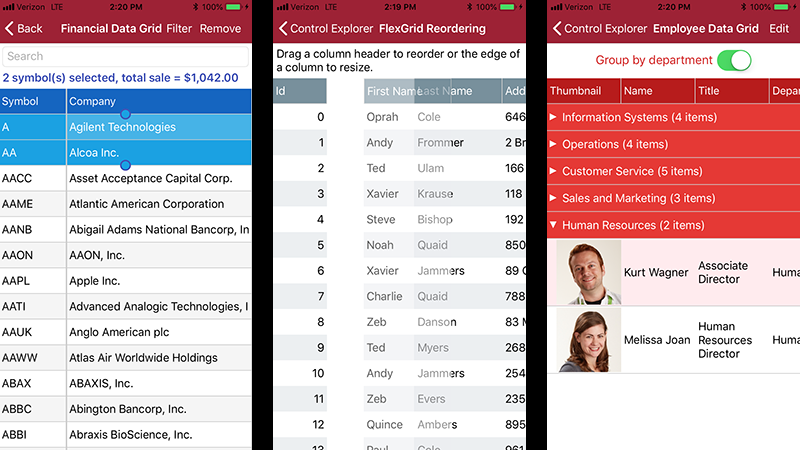 Experience our Xamarin data grid on the device of your choice. 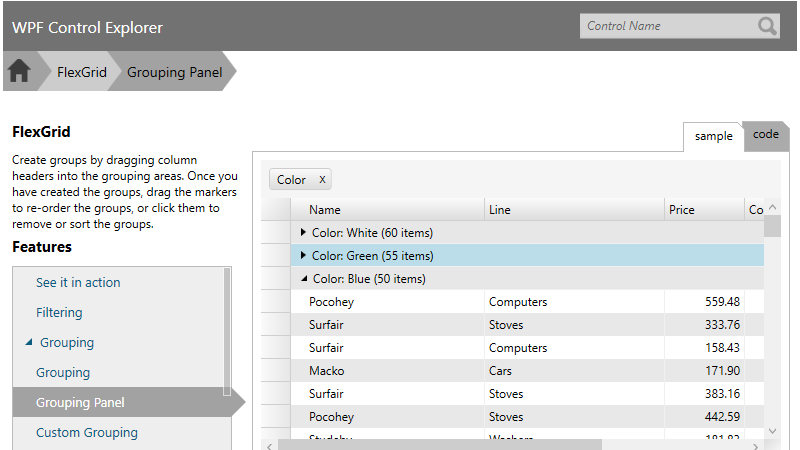 Try pull-to-refresh, freeze columns, grouping, multirow select, and more. 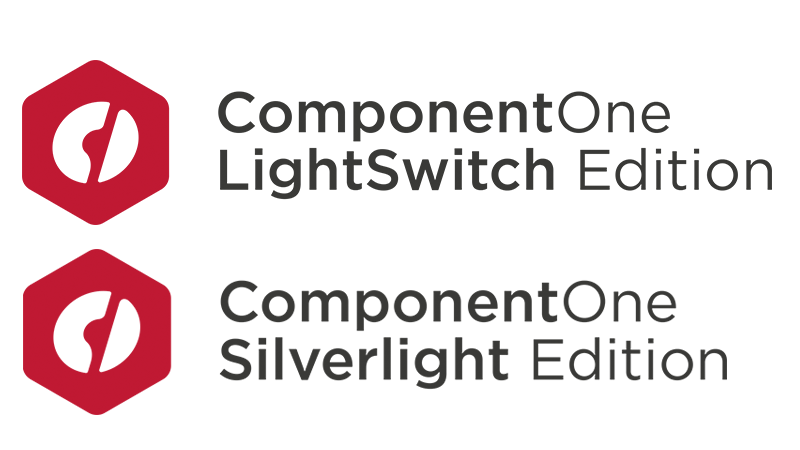 These demos require Silverlight to run and may not operate on some modern browsers. 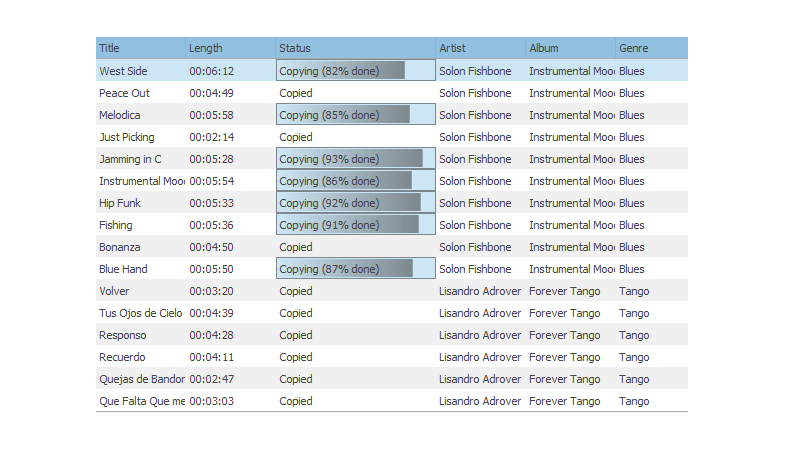 Using tools within the Microsoft ecosystem, ComponentOne Studio has extended charting capabilities with advanced features such as trend lines and scaling. 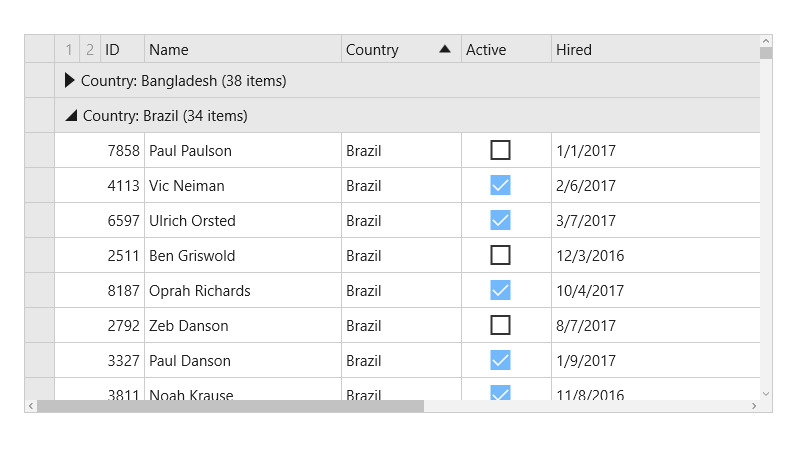 Dave Mendlen, Senior Director of Developer Marketing - Microsoft Corp.
We needed to quickly construct mobile documentation software with ease-of use, a comprehensive feature set, and flexibility. ComponentOne Studio FlexGrid provided us with just that, plus saved us hours of work and coding. ComponentOne FlexGrid is brilliant. 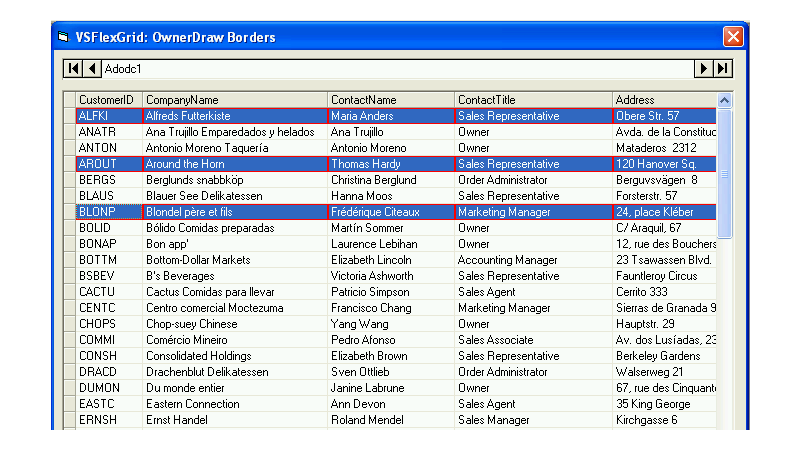 You want it to look and act like Excel, and ComponentOne FlexGrid is the first control that does it properly. 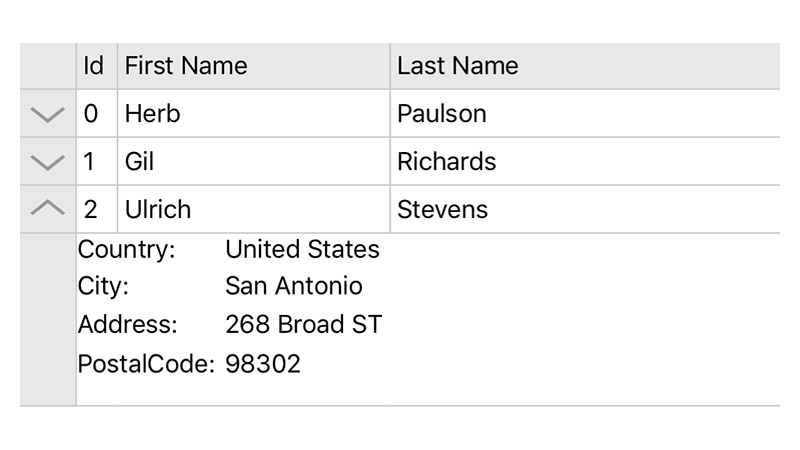 It makes it a cinch to edit and display since you can cut, copy, use, and manage data just like Excel.